When you leave an organization or a company, you are required to get funds or services transferred to your new account. With the help of UAN, you can view all the details which are linked to it. EPFO made it mandatory to have a UAN account if one wants to withdraw their EPF balance. If you want to know more about UAN and its UAN status, keep reading the following article. How to check your UAN status? Uan Claim Status Online – If you want to uanmembers epfo services – EPFO members can check the status of UAN online. of your UAN account, then follow the steps mentioned below. Select the link Know Your UAN Status. Here you can choose to enter either the Aadhar, PAN, PF number or Member ID. If you select Member Id, then you have to choose the state and office from the drop-down menu and enter your Member Id. After entering, you need to fill in your personal details like name, date of birth, mobile number, and captcha code. Click on the button Get Authorization Pin. You will receive a PIN to your registered mobile number. Enter the PIN received and click on ‘Validate OTP and get UAN’ button. Now the page will display a message that Your UAN number and status will be sent to your registered mobile number. If you have selected Aadhar or PAN instead of Member Id, then follow the process below. Enter your Aadhar number or PAN and personal information such as name, date of birth, mobile number, captcha code. Click on the Get Authorization Pin button. Enter the PIN you received on your mobile number. The status of your UAN will be sent to your mobile number. How to check your UAN status from EPFO website? You can also check the status of your UAN by visiting the EPFO portal. If you want to know how then follow the steps below. select the option Our Services. Click on For Employees from the drop-down list. Now select Member UAN online services. Click on the button Know Your UAN Status. You can enter your PF number, Aadhar, PAN or Member ID. Fill in your details like name, date of birth, mobile number, and captcha code. Select the button Get Authorization Pin. Enter the pin received to your registered mobile number. Now the status of your UAN will sent to your mobile number. 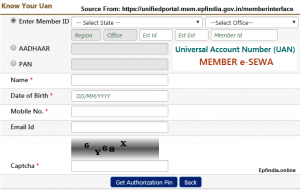 UAN is allotted to all the active members of PF account. You can link all your PF account number to the UAN with the help of UAN member portal. You do not need the approval of your employer to link your PF accounts to the UAN. After linking, you can check the balances of your various PF accounts. You do not need to apply for PF transfer online in order to transfer the funds. You can directly transfer the amount from your old PF account to new PF account with the help of UAN. Check the balance of your PF whenever you want using UAN. You can keep track of your provident funds which is deposite by your company every month. And Finally Check the balance of your EPF using UAN and the details can be using to validate your profile by the employer. If your UAN is not active, then activate it immediately to avail more benefits related to EPF. Anyone can generate UAN number, even though he or she is unemploye and not a member of EPF scheme. You can also update or change the KYC information and download the UAN passbook online by visiting the EPFO portal.